Now think back to your history lessons. What were the great texts that you read? You can probably name some that you encountered. Perhaps Domesday? Remember Orderic Vitalis? Perhaps a few speeches: Elizabeth, Charles I, Martin Luther King, President Kennedy? But in what form did you encounter these? My hunch is that in most cases these texts are encountered in a nice square box in a textbook with the heading “Source B” and a single sentence of italic text underneath saying who the author was and when it was written. Although there continue to be debates in English Literature about reading whole texts, I do not think anyone suggests that you can learn about Shakespeare by reading five lines of Macbeth, nor that you could compare (say) the Crucible and a View from the Bridge by studying a single quotation from each. This, then, is the gobbetisation of history. Our encounters with texts – whether contemporary sources or subsequent interpretations – tend to come in the form of short extracts, perhaps in some cases just a few lines long. Some caveats here are of course necessary. A few resources encourage more in-depth reading (see, for example, some of the resources available from the National Archives). A number of history teachers have written about using longer extracts, or even whole texts, with pupils, and I can do little more here than point you towards Christine Counsell’s work on extended reading and the generation of history teachers whom she inspired to write about the use of longer texts in history lessons. But the great driving forces in history education – the GCSE and A-Level exams, and the textbook industry that goes with them – have remained wedded to a version of Death by Sources A-F.
Now I have written before about the use of sources in public examinations, and I do not want to rehearse those arguments in any great detail here. Suffice it to say that I think there is a strong case for using set texts or source anthologies where pupils study specific, named texts and then answer questions on these in exams, as happens in English Literature. Instead, I simply want to point to the wider issue at stake. 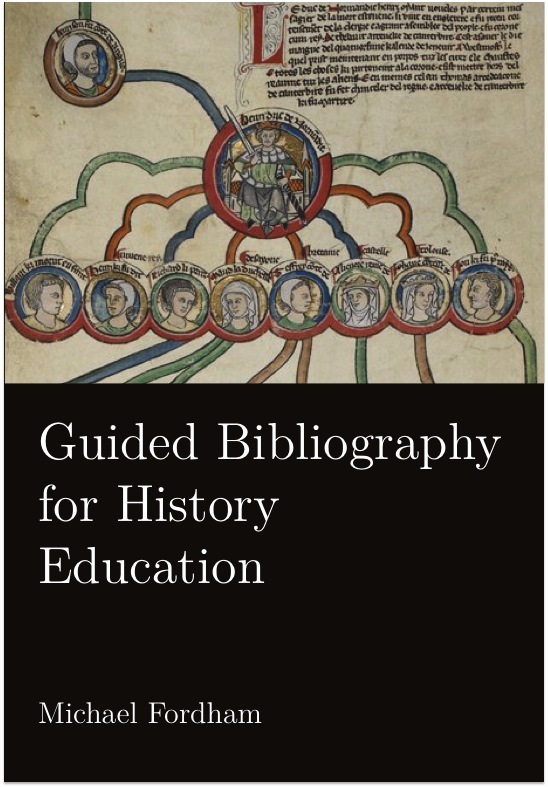 Texts in history – both sources and interpretations – are still frequently treated as tools with which to practise a rather attenuated version of ‘source skills’, ‘source analysis’ or ‘source work’. History teachers have been criticising this approach for decades (see Lang, back in 1992) and, although we have seen some developments (fewer and longer sources, a bit more contextual detail, the end of grossly simplistic ‘reliability’ and ‘utility’ questions), the overall approach remains one of working with gobbets. Even where history teachers do not want to take this approach, they are generally required to by the nature of the GCSE and A-Level exams. This should worry us, if nothing else, because gobbetising sources and interpretations is not particularly historical. Historians do not walk into an archive, read three short extracts labelled ‘A’, ‘B’ and ‘C’, each accompanied by a sentence of context, and then write their latest paper on the extent to which Source B supports Source A. The kind of ‘deep reading’ of a text that is often advocated as an approach for undergraduates (perhaps to wean them off school-style gobbets) requires immersion in the text. But, perhaps more importantly, English Literature does not have a monopoly on stunning texts that excite, appal and fascinate. We have these in history in abundance and it is a shame if we do not teach a selection of these texts in their own right. So what sorts of text might we spend time reading in history lessons? Could a Year 7 class cope with reading the whole Rule of St Benedict? Definitely. I can think of few better introductions to monastic life in the middle ages. Could a Year 8 class read the entire American Declaration of Independence? From experience, I know they can. Can a Year 9 class manage all 17,000 words of the Communist Manifesto? I reckon so. These texts are challenging, but no more so than Shakespeare. If the English teachers can get pupils reading Macbeth, then we can get them reading the Paston Letters (on which see Ian Dawson’s excellent work). For this practice to become widespread does however require a different culture. For a start, the way public examinations work would have to change (you can read my recommendations on that). But, perhaps more importantly, we would need to start having a conversation about what are the texts that all children ought to have read? English Literature teachers are well-versed in those debates: there is no definitive list of texts to teach, but there certainly are a number of criteria to consider in putting together a ‘balanced’ curriculum. Should all pupils read a medieval chronicle? Or a set of letters from the gentry? Or a speech of Oliver Cromwell or Winston Churchill? We do not have these discussion in history at the moment to any great extent, and I think this is primarily because our emphasis has typically been on “what are we doing with sources?” rather than “what sources shall we read?” The gobbetisation of texts encourages us to focus on process and not on substance: if a text can be reduced to a gobbet, then we are implicitly saying that the text as a whole has little value. “No need to read the whole thing: here’s the gist”. On such a conclusion, the value of a text is simply that it enables a particular kind of historical thinking, rather than being an end in itself. This is the kind of culture that I think we could do with shifting in history education. Lest I be misinterpreted, I should finally say that I am not advocating that all history is taught in this way. To read a text fully takes time, and it necessarily involves going into depth. A sensible history teacher will use that depth to open up overview (e.g. the Rule of Benedict immediately raises questions about the nature of medieval society), but I am not suggesting that this is the basis of every half-termly scheme of work. But imagine if, every year, pupils got the chance to read three full texts in detail. In twenty years, your pupils might think back to your lessons, and be able to recount some of the classic texts they read. That, I think, would be a beautiful legacy from our teaching.